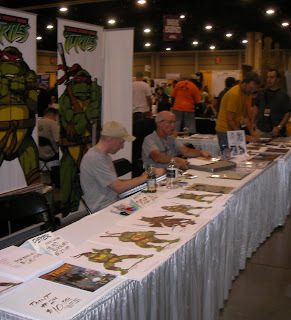 The third day at Heroes Con went very much like the first two -- lots of nice people, lots of signing, handshaking, chatting, and so forth. I did more head sketches, and sold more prints... and I got a couple of presents from fans. 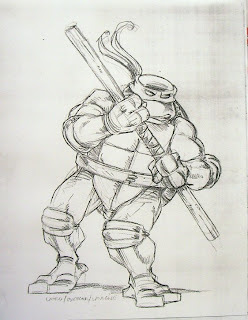 One such gift was a really cool -- and large -- drawing by a young man named (if memory serves) Ryan Miller, who came by our tables to meet us and talk Turtles. The piece of art he gave me is quite nice, as you can see in this photo of me and Ryan. 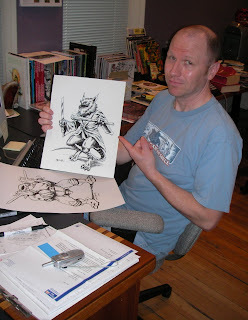 He's holding a color head sketch that Eric Talbot and I did together, and which I gave to him in a sort of trade for his drawing. I think this guy has talent. We left the show a little early, around 3, as we were anxious to get on the road for the long drive back home... and the next day, around 6PM, we were back in Northampton. Jim and Eric were great traveling companions, and I thank them heartily for agreeing to drive with me down to Charlotte. So we're back at our hotel after the second day at Heroes Con, watching out of our windows as a big storm lashes the city with heavy rain. (I'm glad we left the convention hall just as it started to sprinkle, and got in to the hotel before the deluge.) It was another good day -- lots of nice folks, plenty of signatures to do, hands to shake, etc.. I did quite a few head sketches, sold a bunch more prints, and today completely sold out of the twenty-five portfolios of small prints I made to bring here. 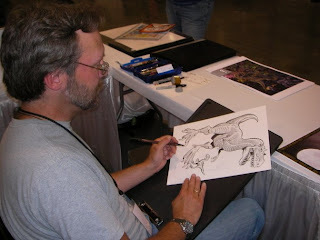 This is Jim Lawson working to uphold his "convention sketch hero" status. This incredible piece is something he just knocked out for the heck of it during a lull in the flow of people at our tables. 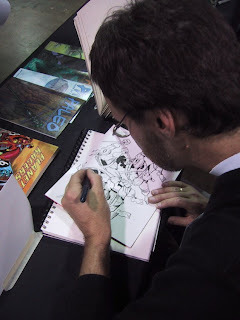 Mike Dooney is shown here carefully doing his precision inking on one of the several sketches he did of beautiful women from the comics. Mike brought with him a simply AMAZING sketchbook which he had completely filled with similar drawings in brush and marker. All our jaws dropped when we looked at this thing -- just gorgeous. I think about half of them have sold so far. I seriously doubt any will make the trip back to Northampton. Here I am posing with this cool thing these two guys (whose names I forgot to get -- sorry, dudes!) brought over to show us. It's a mock-up of a package of "Kirby Krackle", made to look sort of like a box of cereal. Don't know what "Kirby Krackle" is? It's the name given by some afficionados of Jack Kirby's work for those "cosmic energy dots" that Kirby used to great effect to show the release of concentrations of vast power. These two gents were big Kirby fans, and it shows. 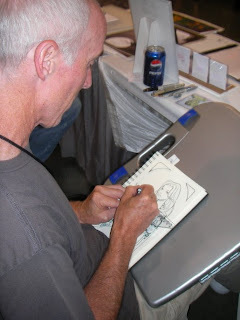 Here's Dan hard at work inking a cool drawing of Casey Jones -- I think Dan sold several similar drawings today, and the people who bought them got a GREAT deal. 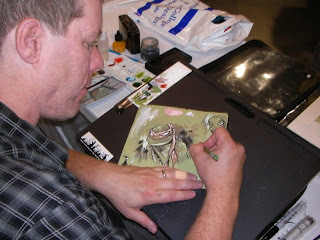 Eric is shown here finishing up one of his unique color pieces. 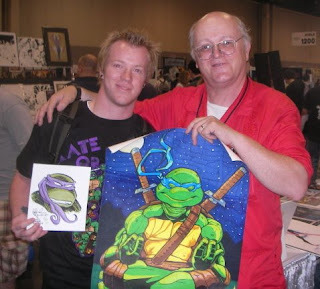 He's the only one of us who is doing color stuff at the show, and today he and I sold several of our color TMNT head sketch collaborations. I'm just about ready to head over to the Charlotte convention center to start day two of our sojourn at the Heroes Convention. Yesterday -- Day One -- went very well, I think. People were friendly, we were busy but not inordinately so, and I sold a bunch of prints and portfolios, and did quite a few head sketches. 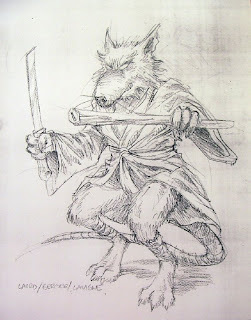 (I even met someone who has posted comments on this blog under the handle of -- I hope I get this spelling right -- "Michelangelo-Sama", who seemed like a real nice guy.) And, in the absence of our good friend Steve Lavigne (who, sadly, could not make it down to this show, and we miss him), Eric Talbot is collaborating with me on head sketches -- I draw them, and he will color them if desired, in his inimitable style. 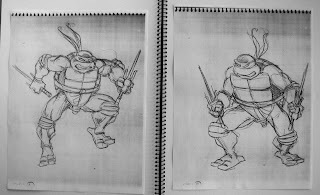 When I was working with 4Kids and Playmates to try to come up with a nifty logo for our 25th anniversary, I had the idea of taking the Turtles from the first two-page spread in the first issue of the TMNT comic (pages 2 and 3) and redrawing them in a clean, easy-to-enlarge-or-reduce form. 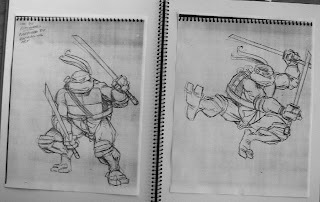 Doing so required me to fill in some some details that were obscured in the original drawing, as in that work the four Turtles' figures overlapped at some points. "Four Reptiles and a Rodent"
Mike Dooney gave me a hard time when he saw me working on this at Mirage today. 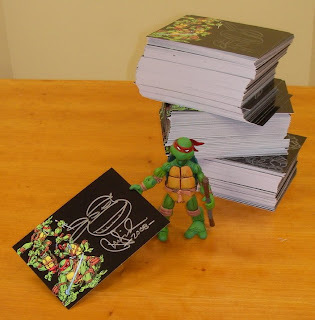 I think he threw up his hands and yelled something like "Oh my God -- MORE prints??!!" "Yes," I said, "but they're SMALL prints." I decided to try the portfolio idea with those prints I made to take to the Heroes con, reformatting them a little and reducing them in size to 8.5 by 11 inches. I think they came out well, so much so that I am a bit further along in being convinced that it might be a good idea to offer them for sale through the Mirage website. I'm not sure what I'll sell them for at the con -- maybe $20, maybe $25. 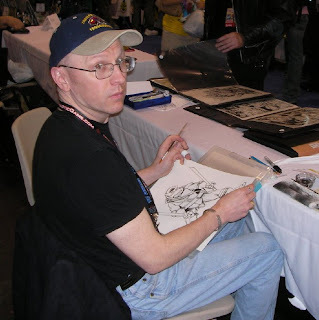 I've said in the past -- maybe even on this blog, though I can't remember exactly -- that my friend Jim Lawson is in the running for the title of "Hardest-Working Man in Comics". The dude is prolific and has a work ethic to be admired and envied (I know I do). While going through some photos last night, I happened upon these images from a show we did in Boston back in 2003. 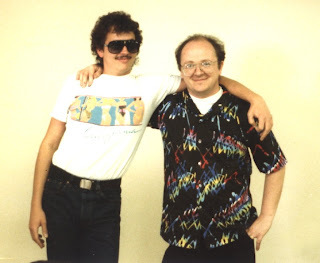 I'm pretty sure this was a commission for a fan Jim met at the show. 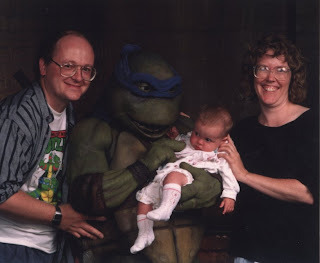 The animatronic Turtle suits created by Jim Henson's crew for the first TMNT movie were, quite simply, wonderful. I remember being blown away by how beautiful they were and how much the performers and puppeteers were able to get out of these clever and carefully-crafted agglomerations of latex, paint, leather and various fabrics. 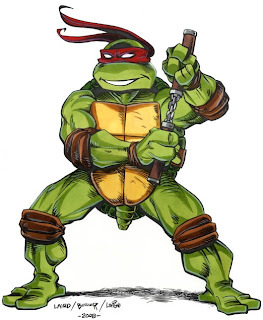 There were a number of suits made for each Turtle, and they were separated into the "hero" or "acting" suits, which were worn by the principal performers and used in all of the scenes in which a Turtle had to act, and the "stunt" suits. 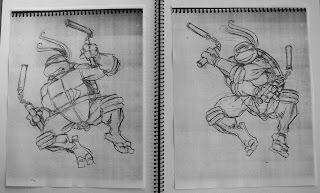 The hero suits had the complex and very expensive and delicate animatronic mechanisms which allowed the puppeteers to give the Turtles a wide variety of expressions. The stunt suits, on the other hand, did not have these mechanisms and were thus much lighter and allowed the very talented martial artists who wore them to do all kinds of very cool and exciting moves. 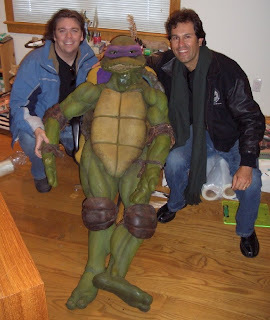 After the first movie was finished and released, the Henson folks generously gave Kevin and me each one of the stunt suits. 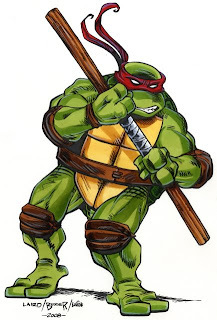 I believe Kevin got Raphael, and I got Donatello. 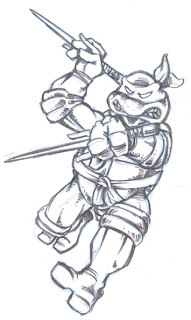 My Donatello suit was, I'm pretty sure, worn by Ernie Reyes Jr., who did most of Donatello's stunts in the first movie (and later appeared without a Turtle costume as "Keno" in the second movie). When I got my suit, I put together a jointed wooden "skeleton" to insert into the suit and allow me to pose it in various positions for display. Well... that was the plan, anyway. It never really worked that well -- the suit is actually pretty heavy, and the joints I made couldn't hold it up. So the suit ended up kind of sprawled in a chair in my studio. And that's where it has sat, more or less, for the last fifteen years or so. 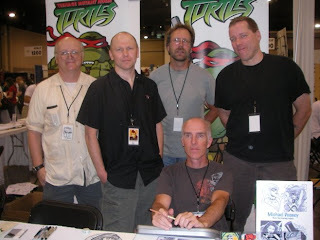 Mike, Don, Raph and Splinter... in amazing Lavigne-O-Color! 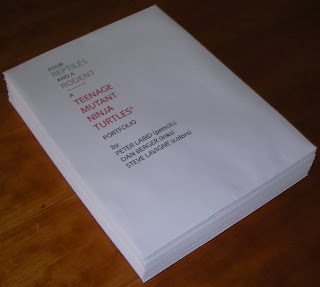 Through the miracle of a fast Internet connection and Steve Lavigne's ftp site, today I downloaded his scans of the finished color work on the drawings of Michelangelo, Donatello, Raphael, and Splinter that Dan Berger and I did together. Once again, Steve did not disappoint. I drew a small head sketch on each one along with my signature. 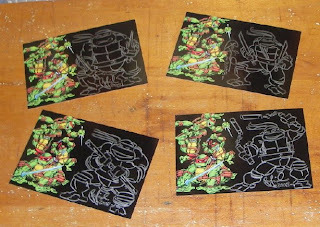 As a special surprise, I did one Splinter head, one Shredder head, and a full body sketch of a Turtle on four different cards. I don't have the time and/or the energy to respond to every individual point raised or question asked, but I will try to hit here what I see as the key issues. Before I get into it, I would like to take this opportunity to thank everyone who commented passionately while doing so civilly. It makes for a much more pleasant read and a productive discussion, don't you think? (And as an aside -- in one of those odd, serendipitous life moments, I was driving home today, listening to NPR while musing about this response I was going to write, when what came on the radio but a fascinating story about what I believe was called the "Hip-Hop Chess Federation". Actually, I just Googled it, and came up with their website (http://www.hiphopchessfederation.org/). 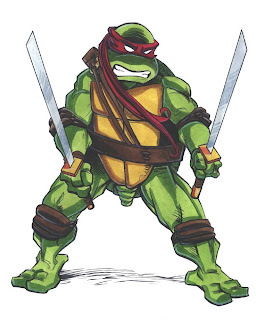 Okay, the first thing I'd like to address are the comments made by several people about how poorly TMNT toys do in stores compared to Toyline A or Toyline B, because it's plain to see that those other toys always sell out. Really? Is this an anecdotal, seat-of-the-pants, off-the-cuff estimate, or do you have insider information from the toy companies in question about (a) what they actually shipped to ALL the stores, and (b) how many of those items shipped actually sold? I seriously doubt it's the latter. It's easy to make those kinds of judgments, but not always accurate. There can be any number of other factors involved. For example, how may of you have had the experience of going to one toy store and not finding even one example of a particular figure or vehicle... then going to another toy store and finding a whole bunch of them? I remember when I used to buy a lot of toys, this would happen quite often, to the point where I developed a routine when I looked for a particular type of toy -- for some things I'd first head to Toy's 'R' Us, for other to KayBee, for others WalMart, and so on. There is substantial store-to-store variation, in my experience. 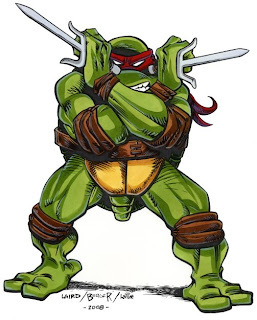 Second, I would like to request that, when we have these discussions, that everyone PLEASE refrain from making this type of comment: "If Playmates put (fill in the blank) in the TMNT toy line, I guarantee it would sell!" When I saw this in one person's comment, I had to mightily resist the almost overwhelming urge to respond with a snarky/sarcastic comment to the effect of "Will that guarantee be in cash held in escrow, bonds, gold bullion, etc.? Will you be guaranteeing the entire cost of production, or just estimated sales, or both?" Really, I know how very tempting it is to say this when you think you have a really good idea, one that JUST CAN'T MISS!!! -- but the sad fact of the matter is that, while every so often it happens, it is hardly a regular occurrence, especially in the toy industry. And Don's not called "Rapper Don" -- on the concept art board, he is labeled as "DJ 'D'". I suppose to some folks that immediately makes him a "rapper", but I guess I see it a bit more expansively. 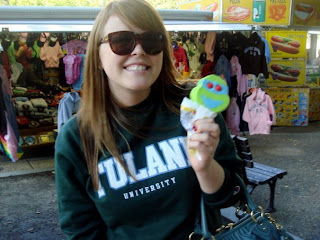 "I was visiting Zach in DC and when we were visiting the museums we saw them being sold at an ice cream truck... it tasted delicious, and had the eyes in the right place for once." 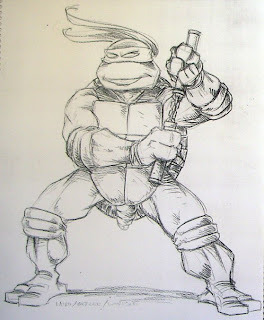 Over at Murph's "5th Turtle" blog, there has been a lot of discussion about TMNT toys, mostly about those from Playmates. 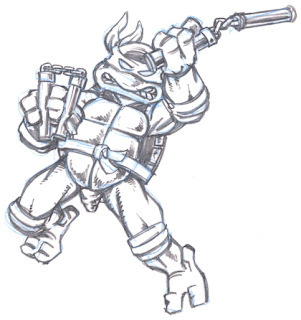 Throughout the discussion, there has been one fundamental misconception about how the TMNT toys get made that keeps popping up. 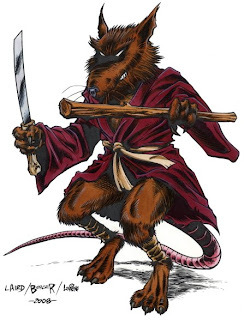 It's usually in some form of comment like "Mirage should make Playmates do GOOD figures/toys, like Jagwar from the Archie TMNT comic." Mirage doesn't MAKE Playmates do anything, much as Playmates doesn't MAKE Mirage do anything. Mirage and Playmates work together to try to come up with what we both agree will be good, sellable toys that KIDS will want to play with. In this endeavor, we are partners. Yes, Mirage can reject designs or proposals from Playmates that we don't like. 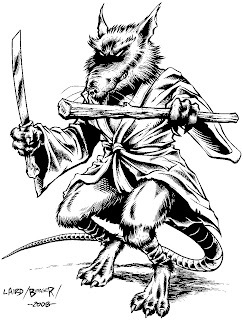 Yes, Playmates can demur from making toys that Mirage wants to see made. (Vacuum-metalized Fugitoid, anyone?) But we try to come to a meeting of the minds, respecting each other's position and expertise, and create toys that KIDS will want. We've worked with Playmates for twenty years. I have come to have great respect for them, and for their knowledge of the toy industry. 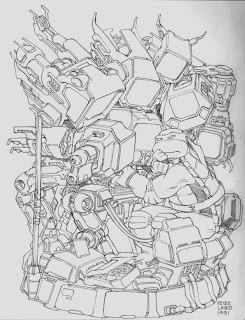 Have I always absolutely LOVED everything they've done with the TMNT line? No. Have they always absolutely LOVED every design or concept change we've required of them? Surely not. But I think that overall, they have produced a whole lot of great toys with a lot of "play value". Talk is cheap -- it's easy to say things like "Hey, Jagwar would make a great figure! Why don't you make one of HIM, dumbass?!" Well, maybe... but would that figure SELL? (Sell more than the hundred units or so you might sell to the people who read and post comments on these blogs, that is.) Making and selling an action figure is not a simple or inexpensive thing. It takes a lot of money to cut that steel for the molds, to devise and produce the packaging, to advertise and market the toys. It is, in the final analysis, a BUSINESS. Risks can be taken, but they have to be carefully-weighed risks. 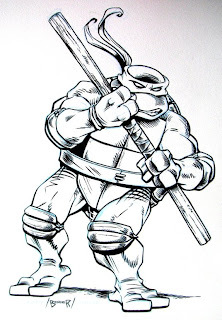 Once again, Dan comes through and delivers an awesome inking job. 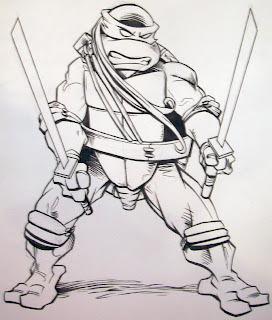 When I went in to Mirage today to prepare the artwork of the three Turtles to send off to Steve Lavigne to be painted, Dan surprised me by having completed the inking on the Splinter drawing I gave him yesterday. Here he is posing with the finished piece. 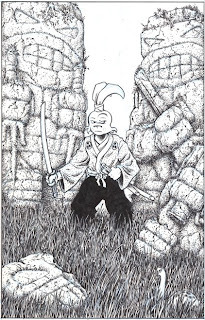 Drawing from "The Art of Usagi Yojimbo"
A few years ago, I had the great pleasure and honor of being asked to contribute to "The Art of Usagi Yojimbo", a REALLY nice hardcover art book all about my friend Stan Sakai's character and comic book, "Usagi Yojimbo". They didn't have to ask me twice! I had a lot of fun drawing this piece. 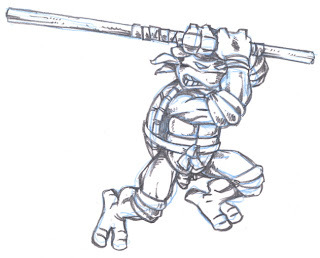 I wanted to include the Turtles somehow, but not obtrusively -- I mean, this was "The Art of Usagi Yojimbo", not "The Art of the Teenage Mutant Ninja Turtles", after all. So I figured out a way to do that, and I think it worked out okay. 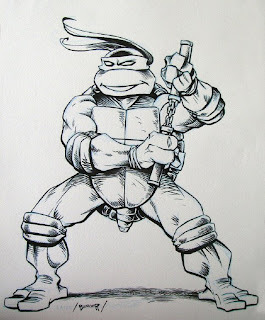 This is one of my favorite drawings of my favorite Turtle. 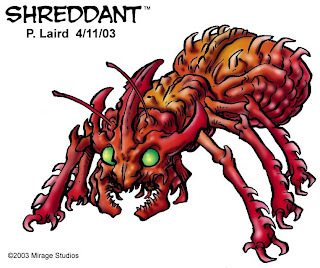 I drew this, "cyberinked" it, and colored it in Photoshop for inclusion in a portfolio of prints that Mirage Studios published years ago. 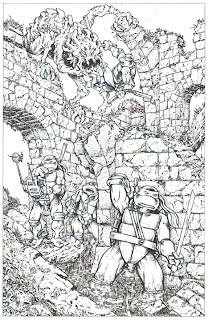 If I remember correctly, the portfolio included work by Kevin Eastman, Michael Dooney, Steve Lavigne, Dan Berger, Ryan Brown, Jim Lawson, and Eric Talbot. 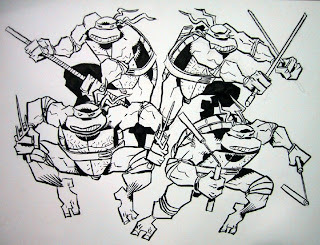 As you can see, Dan Berger worked his special brand of inking magic on my three Turtle drawings. I'm going to scan these tonight and hopefully get them off to Steve Lavigne tomorrow so he can start laying colors down on them. 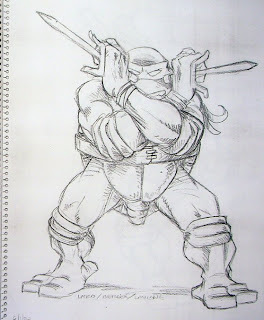 One of the fun things I did at the New York Comic Convention back in April was taking a few minutes when there were no fans at our tables (something that didn't happen too often) to sketch out a large-ish drawing of Leonardo in pencil on one of the sketch pads I had brought with me. 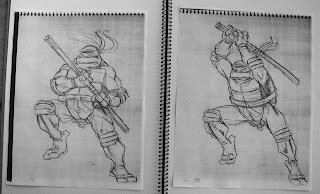 I thought it came out nicely, and I asked Dan Berger if he wouldn't mind inking it. Having a few minutes breather himself, Dan agreed. 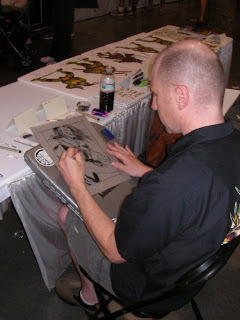 Here he is in mid-inking, hopefully not too irritated that I'm interrupting him to take the photo. As I expected, the results were fantastic. I was also lucky enough to have Steve Lavigne sitting right next to me. 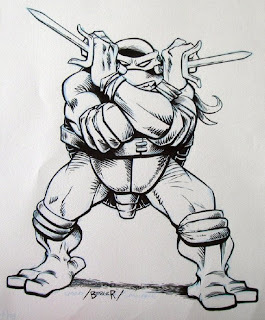 Steve had brought with him his "old school" coloring kit of Dr. Martin's Dyes, and agreed to apply his talents to this inked drawing of Leonardo. I think you will agree he did a great job!